In an interview with Digital Trends, Director of Product Strategy and Marketing at Samsung confirmed that the foldable phone will launch in the first half of 2019. Samsung has finally disclosed a set timeline for the launch of its foldable Galaxy F also being dubbed Galaxy Flex or Galaxy Fold. In an interview with Digital Trends, Director of Product Strategy and Marketing at Samsung confirmed that the foldable smartphone will launch in the first half of 2019. When asked by the interviewer if the device would launch in the first quarter of the year, Suzanne De Silva from Samsung categorically said “first half” not first quarter. Currently, rumours going around the web claim that Samsung may unveil its Galaxy F foldable phone on February 20, alongside the Galaxy S10 series of smartphones. Samsung will be holding its annual Unpacked event on February 20 in San Francisco and very recently, the company put up some billboards in Paris with the words “The future unfolds” and “February twentieth” written on them. This, accompanied by the statements made by De Silva in Digital Trends’ interview, could further strengthen expectations that the foldable phone from Samsung will indeed launch on February 20. Launch does not necessarily mean availability so Samsung could wait until it actually brings the phone to market. Till now, all Samsung has revealed very little about the foldable Galaxy smartphone. 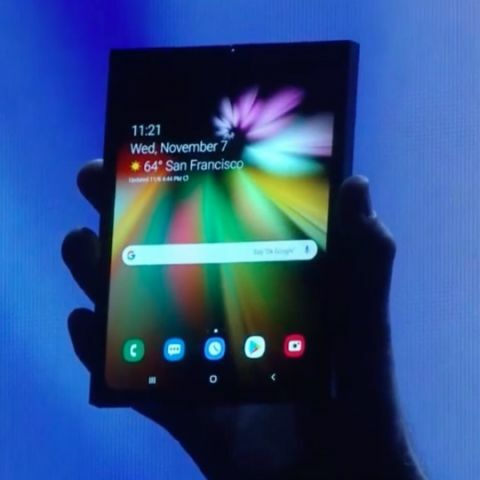 What we do know is that the foldable smartphone uses an Infinity Flex Display which measures 7.3 inches with a 1536 x 2152 resolution and an aspect ratio of 4.2:3 when it is in an unfolded state. It folds in half to reveal a second display called “cover display” on the front. When folded, it functions like a 4.58-inch phone with a resolution of 840 x 1960 pixels with an aspect ratio of 21:9. Samsung says that the phone can be folded up to fit into a pocket. Samsung to launch foldable smartphone next year? In the Interview mentioned above, Samsung’s De Silva says that the Infinity Flex was created to give consumers the biggest display. In November, DJ Koh, CEO of Samsung's Mobile Business Division announced that Samsung will manufacture at least one million units of the foldable device which runs on Samsung's One UI, based on Android 9 Pie. When samsung glaxy grand prime will launch in India?